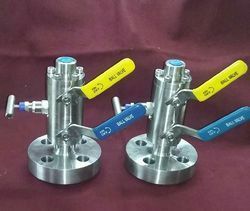 Prominent & Leading Manufacturer from Mumbai, we offer double block bleed valve. Pioneer in the industry, we are engaged in presenting an impeccable range of Double Block Bleed Valve. These are compact as well as lighter in finish, these valves feature lower operating time as well as smooth and easy operations. The specifications these can be made available in include design standards of AWWA-C504 / BS-5155, size range of 50mm to 2000mm and pressure class of 150 Class. We can also offer these in other customized manufacturing standards, design choices, sizes, dimensions as well as material choices as demanded by the customers.